Fascia is a finishing edge or trim that connects to the end of the rafters and trusses. It ensures that your roof is entirely closed off to rain and the elements, while supporting guttering. uPVC has become a popular material used for facia. Unlike wood, it does not rot, which means it lasts much longer. Maintenance-free, UPVC does not discolour or fade over time, which means repainting is not necessary. In fact, all it requires is a wash with some soapy water and it is back to its former glory. Whether you are looking to replace your existing boards or you are looking for a stylish option for your new-build, investing in Floplast fascia is a fantastic way to smarten up your property. Catering to all budgets and specific measurements, we have a range of sizes and thicknesses in stock – just select your preferred fascia from the drop-down menus. If you are looking to purchase the 9mm Floplast fascia, be aware that you will also need to invest in backing board. The 9mm fascia is essentially a uPVC cap, which gives wood the benefits of uPVC for an affordable cost. It is a very popular option for renovation projects and can be applied straight over existing timber, should the wood be in a good condition. We also stock much thicker UPVC fascia. At 18mm, it does not require backing board, as it already has a rigid linear strength and thickness which is fully capable of supporting the guttering. It is available in a range of measurements so you can choose the appropriate size for your roof structure. Alongside fascia, we stock any necessary joints and corner materials. 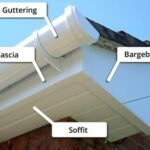 All Floplast fascia and related products are supplied with a 20 year manufacturers’ guarantee, which is applied once the product has been registered on the Floplast website. If your address qualifies for a local delivery, we will be able to supply your fascia as 5m units. If you have a local postcode, contact JJ Roofing directly to confirm that we deliver to your area. We are more than happy to use a courier service to deliver fascia to addresses all over the UK. When using a courier, we cut the fascia to 2.5m for easier transportation and supply the joints free of charge.